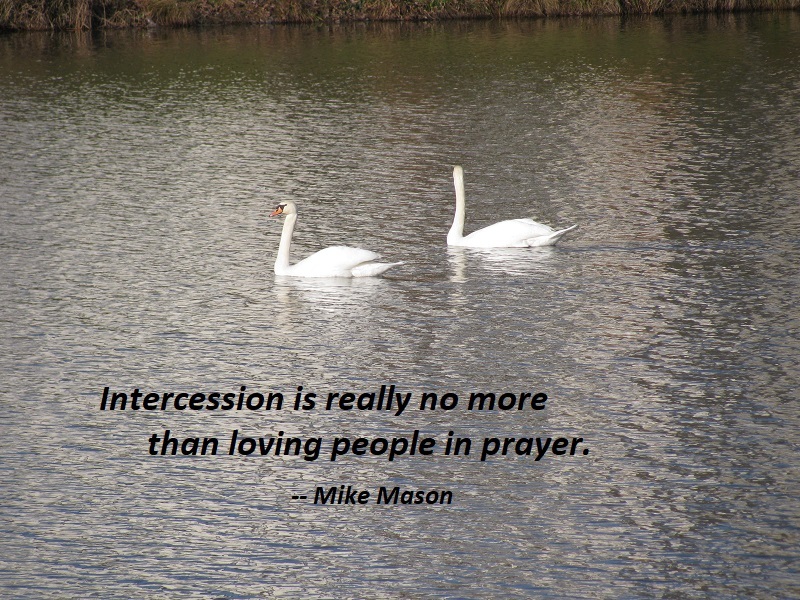 Intercession is really no more than loving people in prayer. It means setting their faces before us and sitting in their presence, still and quiet, for long enough to find out who they are and what they need — in short, for long enough to love them. In prayer meetings one often hears the words, “Lord, we lift up so-and-so before You.” As a formula this can grow tiresome; nevertheless it is exactly what we are to do. In our hearts we lift up people before the Lord, setting them above ourselves, above and beyond all our personal opinions and prejudices. 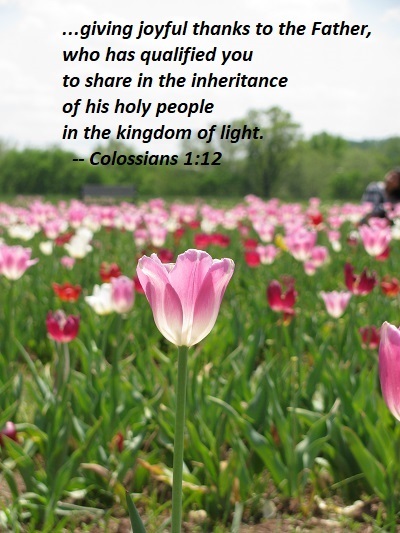 We lift up people to God in order to see them not with our eyes but with His. Without this divine perception, we cannot pray rightly. We cannot bless others until we see them as God created them to be, pure and blameless. Much of what goes by the name of intercessory prayer is not true intercession at all, but judgment. People pass judgment on others and then use prayer to try to get God to reinforce those judgments. We use our own standards to decide what others ought to be like and how they should change, and then we pray, “Lord, please change these people so that they’ll be more like me.” Once people have conformed to our standards, then (i.e., never) we will love them. This is entirely backward. We need to love people first, unconditionally, and only then will we know how to pray for them. True intercessors know that they can do nothing to change anyone else. Only God changes people. Knowing this, intercessors abandon all need to exercise influence over others, and out of this abandonment true prayer is born. If we wish to pray effectively for others, we will never hold their faults against them, never reject them for their failings. It is not that intercessors are unaware of people’s faults — but they are even more aware of the real person beneath the faults, the perfect child of God inside the rough exterior, and this is the person they choose to relate to and pray for. They pray not so much for the outer shell to be corrected, but rather for the spirit within to be encouraged and strengthened. If change is to happen, it will happen from the inside out. 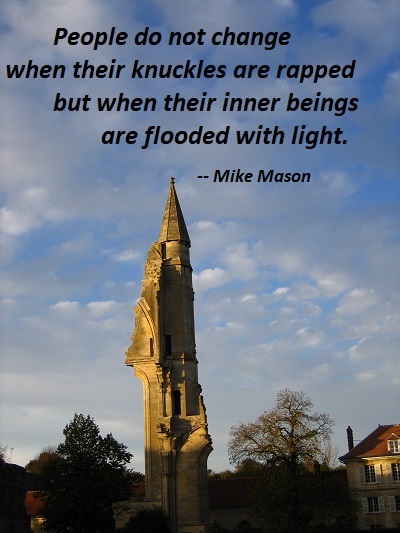 People do not change when their knuckles are rapped but when their inner beings are flooded with light. When you want to give the audience an emotion — whether in acting or in singing or in writing — you have to be on the other side of the emotion. In talking with one of you, I likened it to intercessory prayer. 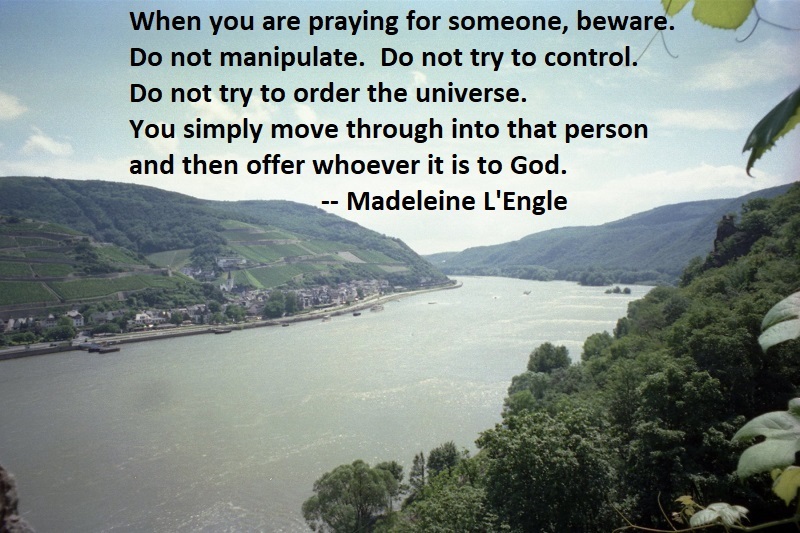 When you are praying for someone, beware. Do not manipulate. Do not try to control. Do not try to order the universe. You simply move through into that person and then offer whoever it is to God. But, again, you go through and out and on other side of emotion. If you are manipulative with your character — one you’re playing, one you’re writing about, or one you’re praying about — then it doesn’t work. For this reason, since the day we heard about you, we have not stopped praying for you. 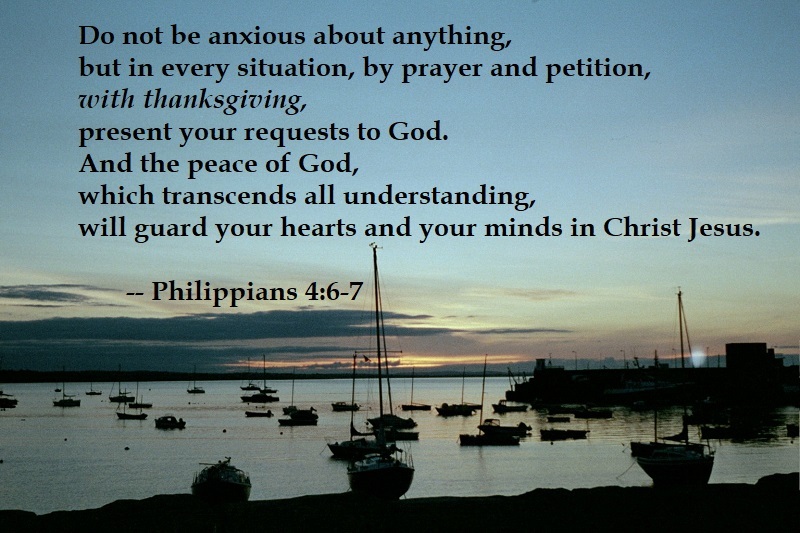 We continually ask God to fill you with the knowledge of his will through all the wisdom and understanding that the Spirit gives, so that you may live a life worthy of the Lord and please him in every way, bearing fruit in every good work, growing in the knowledge of God, being strengthened with all power according to his glorious might so that you may have great endurance and patience, and giving joyful thanks to the Father, who has qualified you to share in the inheritance of his holy people in the kingdom of light. Prayer is a primary means for partnership with God. Prayer is an act of willing participation in the mediation of God’s love. 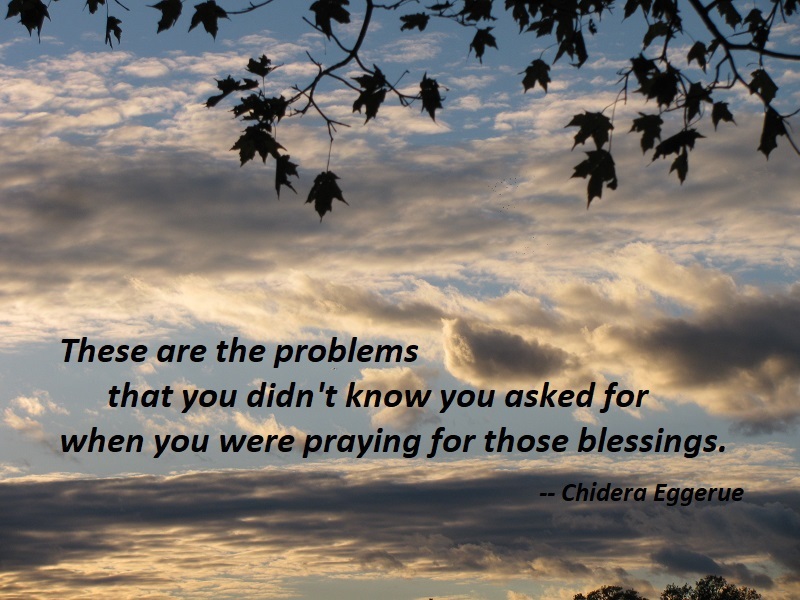 Our prayers somehow play a role in the restoration of all things. 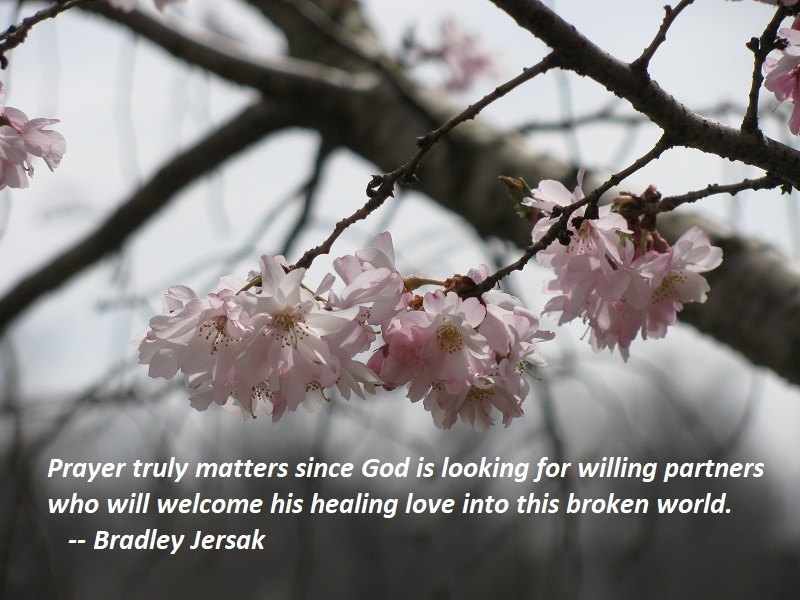 Thus, prayer truly matters since God is looking for willing partners who will welcome his healing love into this broken world. Partnering prayer is also an act of yielding and surrender. In spite of some popular practices of prayer as militant proclamations that ‘pull down heaven,’ Christlike prayer is kenotic, cruciform and willing — not coercive, demanding or manipulative. Parnering prayer listens first to seek God’s will, rather than attempting to impose our will in the world in his name. Partnering prayer is founded and funded in the mercies of God, and is therefore best directed at invoking those ever-ready mercies. How or in what form God chooses to deliver his mercies is finally his domain. We can make requests and petitions, but delivering our demands and dictates seems to me out of order. There is such a positive cycle between prayer and releasing love. When we pray we are asking for ourselves, or for someone else, or we are giving thanks; we are thinking loving thoughts of ourselves and others and, in doing so, we are releasing more love. 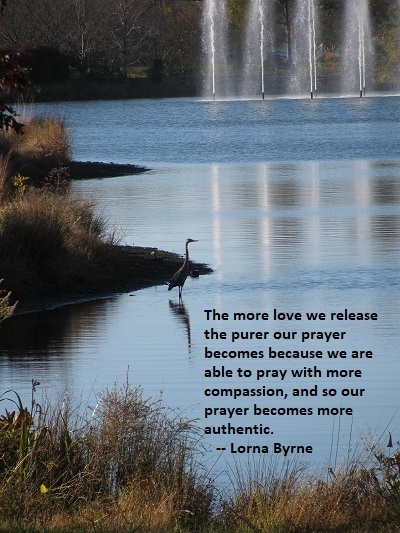 The more love we release the purer our prayer becomes because we are able to pray with more compassion, and so our prayer becomes more authentic. Inspiration comes far more often during work as things get rolling than before you sit at the typewriter. This is because the largest part of the job of the artist is to listen. To listen to the work and to go where it tells you to go. And this involves faith. Letting go of your own control and having faith in something you do not control. — Madeleine L’Engle, Wheaton College Writing and Literature Conferences, quoted in Madeleine L’Engle, Herself, compiled by Carole F. Chase, p. 132. Every time you pray you are talking directly to God. Regardless of your belief in angels, angels are praying with you at the same time, adding power and strength to your prayer. This is one of the tasks God has given the angels. We never pray alone.